Exactly what you would expect if you lived on the outside of a sphere. If you lived on the inside, it would seem to curve upwards. Besides all of this, if you observe ships moving away from you over the horizon, you notice that their highest parts disappear last, and that when they are just over the horizon, you are seeing them from a downward angle, which would be impossible if we were not living on the outer surface of a round object. Yes, easily, using data collected by our own forum members. I'll use two examples. 1) The propagation of seismic waves. On the old forum, midtskogen showed a recording of an earthquake which took place in New Zealand, from his station in Norway. A key observation in this recording is the lack of direct shear waves. Shear waves are not visible from stations located more than about 120° from the earthquake center, because they cannot penetrate through the liquid outer core of the Earth. Another observation is to use the arrival time of the first vibration as a function of distance across the surface of the Earth. If we live on the inside of a hollow sphere, then this arrival time should grow linearly with that distance, because the fastest path the earthquake waves can possibly take is through the surface. So, how does one reconcile these observations with a hollow Earth model? 2) The strength and direction of local gravitational field. On the solid Earth, your local gravity points downward with a strength within a few tenths of a percent of 9.81m/s2. How would gravity work on the inside of a hollow Earth? If you propose the gravity is due to the distribution of matter, then you have a problem. The gravitational field inside of a hollow sphere is everywhere equal to zero! We would all be weightless. If you propose the gravity is an apparent force due to the Earth's rotation, then you still have a problem. You cannot make the local apparent gravity be equal to g everywhere, or everywhere pointing downward with respect to your horizon. [math]a = \omega^2 Rcos\theta, in a direction which is away from the axis of rotation and at an angle [math]90 - \theta degrees from your local horizon. (Oh wait, there is no horizon on the inside of a hollow Earth). Okay, make that [math]\theta degrees from nadir. So at my location at 48°N, I should experience a gravitational force only 67% as strong as at the equator, and pointed 48° from nadir. Midtskogen at 60°N should feel a force with 50% of the equatorial value, and at 60° from nadir. Needless to say, this is very inconsistent with reality. But I'll let midtskogen correct me if he happens to feel like he's standing on a 60° slope at 0.5g. Now let's look at the nine so-called evidences for the hollow Earth. "Some early modern maps have inversed latitude and longitude"
This is not evidence. A sphere has the same geometry whether you are on the inside or the outside, and you can attach coordinates to it in any way you want. "Modern polyconic maps show more accurate sizes and shapes"
Also not evidence, for the same reason. Any projection of a curved surface onto two dimensions will work the same way whether the features you are mapping are on the inside or the outside of that surface. "19th century balloon observations (that is, without an intervening medium) gave the impression of a conclave surface"
So we were on the inside of a hollow until the 20th century, and then suddenly it switched? I like this conspiracy. "4,000 foot plumb lines reportedly were farther away from each other at the bottom of a mine shaft"
Or we can cite the greater distance at the tops of the towers of the Verrazano-Narrows Bridge as a better established and contradictory example. Furthermore, if this claim is true and we conclude it is because we're on the inside of a sphere and gravity is pulling them outwards, then we run into that above problem of explaining how gravity works. "A laser shot between two posts (over water) seems to curve downwards"
Sure: atmospheric refraction. Works just as well on being on the outside of a sphere as on the inside. So this is not evidence. "An old rectilineator experiment indicates a conclave surface (the experiment has been criticized here)"
"Radar and radio wave horizons cannot be explained on a convex ball"
Sure they can. Every experienced HAM radio operator is familiar the role of the ionosphere on radio wave propagation. "Ships disappearing below the horizon are an optical illusion"
AKA: "When faced with observations that are incompatible with your world view, declare them to be illusions." Like stars, the Moon, and satellites. "Light bends upwards, which allows for the rising/setting illusion of the sun and moon"
Atmospheric refraction again. This isn't evidence of being on the inside of a hollow Earth. So this list of nine evidences is really just a list of claims which are either wrong, dubious, or otherwise compatible with being on the outside of a sphere. Dude, the actual arguments are on the website itself! I'm just summarizing what they say. You have to look at the links. Source of the post But why we must see? It can be detected by sonars. But sonars can't go that deep, since they reflect waves as soon as they hit the bottom. We can study the interior of the planet by observing the propagation of seismic waves, as Watsisname mentioned. These observations are consistent with an interior consisting of several layers or material, with no hollow region. But what if it is hollow at the very end, or halfway? Maybe few thousand kilometers bellow the surface. Source of the post Dude, the actual arguments are on the website itself! I'm just summarizing what they say. You have to look at the links. Okay, I have question for you. Do you believe in hollow Earth? You acted like you are defending the author of these links. Or maybe you don't know in what to believe. Source of the post Examples or videos? I don't know if this video is good enough. If you want more, ask. Source of the post Why would it set? Because by observation, it sets. You can see it go behind the horizon, projecting a shadow up into the sky. But inside a hollow Earth, there is no horizon for it to set behind. You could try to explain this with some crazy light bending model as the website claims, but you'll have problems. Near the ground light can bend upward or downward (in the relative to the ground sense) depending on temperature inversions, but for the whole atmosphere it bends downward slightly because of Snell's Law, with the density and thus index of refraction of the air decreasing with height. So making sunsets by light bending doesn't work in a hollow Earth. And if we ignore Snell's Law or invoke some new physics to make the light bend upward enough to cause sunsets anyway, then this predicts there is a ring of nighttime surrounding the day, with another circle of daylight on the other side of the Earth where the Sun is near zenith. Again contrary to observations. I did. They are no more compelling than your summaries were. Many of them are even more nonsense the further you go into them. For example, where they claim that light bends upward due to electric fields, because photons behave like electrons in an electric field, and the hollow Earth produces such a field inside. Well, that is wrong because once again the field inside hollow sphere of charge is zero. Photons aren't deflected by electric fields like electrons anyway, and you can demonstrate this in the lab. Or even at home with simple equipment. Now I'd like to see if you can explain the propagation of seismic waves and gravitational field for a hollow Earth model. Good luck. You could try to explain this with some crazy light bending model as the website claims, but you'll have problems. Near the ground light can bend upward or downward (in the relative to the ground sense) depending on inversions, but for the whole atmosphere it bends downward slightly because of Snell's Law, with the density and thus index of refraction of the air decreasing with height. So this doesn't work in a hollow Earth. And if we ignore Snell's Law or invoke some new physics to make the light bend upward enough to cause sunsets anyway, then this predicts there is a ring of nighttime surrounding the day, with another circle of daylight on the other side of the Earth where the Sun is near zenith. Again contrary to observations. I don't think you understood me. I said 'Why would it set?' because we aren't living in the Earth. Some other civilizations maybe, but we, I don't think so. I don't know if you even now understand what I am trying to say. Maybe I am not that good with the words. It is clear that we have Sunrise and Sunset. I tried to point out that it is not necessary for Earth inside Earth to has sunrise and sunset. I hope you understood me now. If I am missing anything, tell me. Marko S., this thread is about a model which claims we do live inside a hollow Earth, and discussing whether observations are consistent with that or not. So the model must explain sunsets. If that's so... It can't be just explained by light bending and light distortion. I've read in some of the links that on the other side of the Sun, there is Moon. And that's why we have one side of the Moon. It would take so much light distortion to do that and have both Sun and Moon on one side. And if that's it, why don't we see some of the light on the back of the Moon? It would light up the other side of Earth and we would see at least some of it? It is clear that we aren't living inside the Earth. As I said, maybe other civilizations, but we surely without any doubt live on the surface. And I have one question about sonar. How does it work? I would like to know the whole process. I now it sends waves and it bounce out from the rock or other objects and sends it to the detectors placed on the ground. I searched it on internet, but I want your explanation as well. Like, how does it travel in different terrains and other related things. Source of the post But what if it is hollow at the very end, or halfway? Maybe few thousand kilometers bellow the surface. 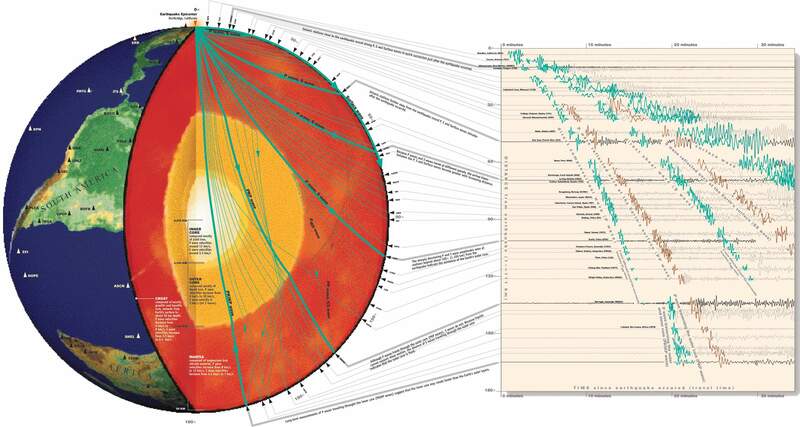 Look at the image that Watsisname posted of the observed propagation of seismic waves through the Earth, as measured from a variety of different seismometers all over the world. You can observe almost every possible path of seismic waves through the Earth, including directly through the center, and there is no evidence of any hollow space. Due to the curvature of the Earth, the laser beam would appear to curve downwards, then back upwards. The reverse would be true if Earth's surface were concave. Example 1: Here is a Falcon 9 rocket on a low, flat-decked barge on the horizon. Notice that you cannot see onto the deck of the barge, despite being at a higher elevation. Example 2: A Falcon 9 rocket poking up over the horizon. Okay, so that means that sonars can go even more than Earths radius. Now, that's interesting. Source of the post I've read in some of the links that on the other side of the Sun, there is Moon. And that's why we have one side of the Moon. It would take so much light distortion to do that and have both Sun and Moon on one side. And if that's it, why don't we see some of the light on the back of the Moon? It would light up the other side of Earth and we would see at least some of it? Yeah, I think no matter how one tries to make sense of it with light bending, there is no model of being inside a hollow Earth that is consistent with observations of positions of celestial objects on the sky. We are very clearly on the outside, not the inside. Source of the post And I have one question about sonar. How does it work? I would like to know the whole process. I now it sends waves and it bounce out from the rock or other objects and sends it to the detectors placed on the ground. Just to be clear let's try to avoid any confusion between sonar and seismometers. Sonar is based on sending out pulses of sound and measuring the distance to various objects or surfaces by the delay of the echo. It's pretty straightforward -- same idea as how a bat uses echolocation. Study of the interior structure of the Earth with seismic detectors works a little bit differently. Instead of using a single detector with a pulse of sound to measure the surroundings, you use many detectors around the world and record the vibrations of an earthquake. Regular sonar isn't powerful enough to penetrate the whole Earth, usually. (Perhaps an underground nuclear detonation could do it). But waves from an earthquake ring throughout the whole planet. An earthquake sends out different types of waves: primary (P wave) and secondary (S) waves, so called because the primary waves reach a distant detector first. You can think of P waves as like sound, where the material vibrates in the same direction as the wave is moving, while in S waves it vibrates perpendicular to the wave movement (think of a wave on a string). These waves spread out through the rock as a spherical shell. At least at first. Because the wave speed depends on density, and the density of the rock increases with depth, the waves get bent (refracted). P waves also travel faster than S waves, which is why they arrive first. What the graphic shows is precisely how these waves are reflected and refracted through the structure of the Earth, which you can then associate with the seismometer readings on the right. For example, once you're more than about 30° away from the quake, you begin to see part of the first P wave which was reflected off of the surface to reach you. You also see an increasing delay between the first P wave and the first S wave. But once you're more than about 120° away, you lose the S wave, since it couldn't pass through the liquid outer core. Instead you see parts of the S wave which only passed through the mantle, and reflected off the surface to reach you. So you can combine all these observations to build a model of what the interior structure of the Earth has to be, and it is extremely powerful. There is a surprising amount of information you can extract from these data, and in fact this is exactly where much of our knowledge of the structure of the Earth comes from. Source of the post On the old forum, midtskogen showed a recording of an earthquake which took place in New Zealand, from his station in Norway. A key observation in this recording is the lack of direct shear waves. Thanks, Wats. I was going to make a post that I have an instrument in my basement that I bought as a DIY kit for £400 which convincingly demonstrates that the Earth cannot be hollow, flat or whatever. But I decided not to go through that trouble. Seismometers are superb educational instruments. Hollow earthers are lost cases anyway, but for curious minds seismometers are great for learning how we can know so much of the interior of the Earth with such simple instruments. Professional seismometers will pick up surface waves of underground nuclear explosions anywhere, except perhaps for the weakest and most distant nuclear explosions. My seismometer is in the borderland of picking up Kim's explosions in N Korea, which despite NK TV reports, haven't yet reached the power of proper fusion bomb which would be easily detectable. Hahaha, right. We're fortunate that Earth provides us with even more powerful disturbances to use for measurement, though not so much for those who live close by or hit by tsunami. That's very interesting about picking up North Korea's tests.